← Here comes 2012 – a banner year for political junkies! Over the past week or so news of Mitt Romney’s long road trip with his family dog in a kennel tied to the roof of the car has gone viral on the internet and in news casts. Some might view this story from many years ago as a trivial matter that in no way deserves so much attention. But in my view it is a welcome call for thoughtful consideration of not only what we value in a political leader, but also the connections between what we all do in our personal lives and our public/political lives. Recently my son brought a most amazing little creature into his life, and so now, I have the most adorable granddog imaginable. 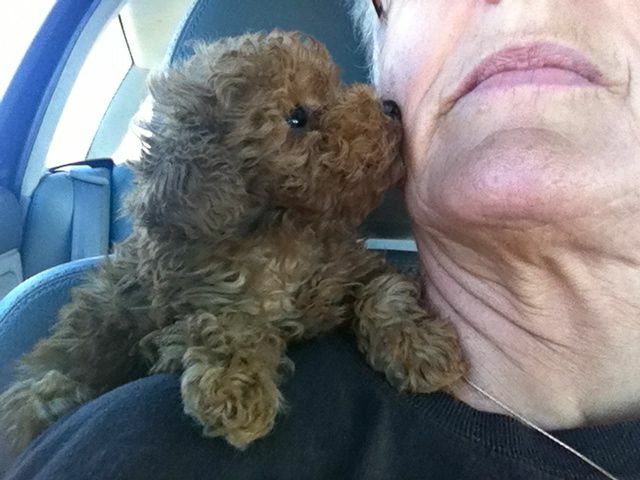 Her name is Coco, and in the photo here you see her giving me kisses on the long 4-hour ride home to Oakland after picking her up at the breeder’s. She was 8 weeks old at the time, and her preferred perch was on my shoulder, just as you see her here. Now, at the age of 3 months, and barely 3 pounds, she still greets me with enthusiastic kisses that you can only imagine from this photo! So exactly what is “wrong” with the image of Romney’s dog being transported on the roof of his car, especially given the part of the account that includes the dog experiencing dire gastrointestinal distress, being hosed down to clean up the mess, then returned to the roof-top kennel to continue the trip? What does it mean when any of us engage in scenarios in our personal lives that raise questions about how we view and treat those around us who are less powerful? What is the value of calling for a broader consideration of the meaning of such incidents? It is true that no one incident, especially one from years ago, is sufficient to provide a definitive picture of what a person stands for or how they will perform in a public role in the future. But it is sufficient as a spring-board for raising the kinds of questions that many are now examining, not only related to this one candidate running for the U.S. presidency, but for all of those in whom we place public trust. The fact that public discourse has turned to questioning the values and ethics of public practices that shape private lives, and vice versa, is one of the most important developments of the past few months. The dog-on-car incident stands, for me, as a symbol of the abuse of power that has happened in many many governments, corporations, institutions, and yes, even religious organizations. When any of us feel at liberty to take advantage of someone in a less powerful position than we ourselves hold, we are essentially engaging in a “dog-on-car” action that speaks volumes about who we are and what we are willing to do with power. We are responsible as citizens to call to task our leaders, bankers, businesses we engage with – calling on them to “do what they say” and live true to their values in all aspects of life. But this all starts right at home. As a teacher, I am responsible to be ever mindful of the relative power that I hold when I engage with students. As an adult, parent and grandparent, I am responsible to be ever mindful of the power that I hold in relation to the children in my life. I am basically an ordinary woman living an ordinary life … but still, I hold powerful weapons that could be used to exploit and abuse others (children, students, friends). I have the same choices that everyone else does! So here’s to precious Coco, the most cherished children in my life, my friends and family! Not only do I want my life and interactions to live up to my highest ideals of love and peace … but I also pledge to always value any time when it is necessary to call on me for full accountability along these lines! And, here’s to ongoing dialogue that helps us all bring more clarity to what we need in our public leaders, and in those in whom we place our trust. This entry was posted in Making change, Politics, Reflections, Social Issues and tagged ethics, personal and political, values. Bookmark the permalink. I love your web page and the blogs, finally had a chance to cruize around here. thanks Peggy for all your passion and wisdom, I am honored to be in your circle of friends! congratulations on your new grand dog…wonderful blog entry…thanks so much for being who you are and I am so thankful I had the opportunity to learn from you and share experiences…you are a gift! So great to hear from you Bonnie! You said this so well. Right on.